Here you thought you couldn’t go wrong. I mean white is white, right? –Well, not really. Choosing white paint for your home can be tricky because there are a lot of slight variations in white paint and a lot of things to consider: natural and artificial light, other colors in the room, and how you want the room to feel. So today, I’m going to walk you through how to choose white paint for your home and give you a list of best white paint colors as a starting point so you can avoid costly painting mistakes and be on your way to a home you love. Should you use the same white in every room? The short answer is no. 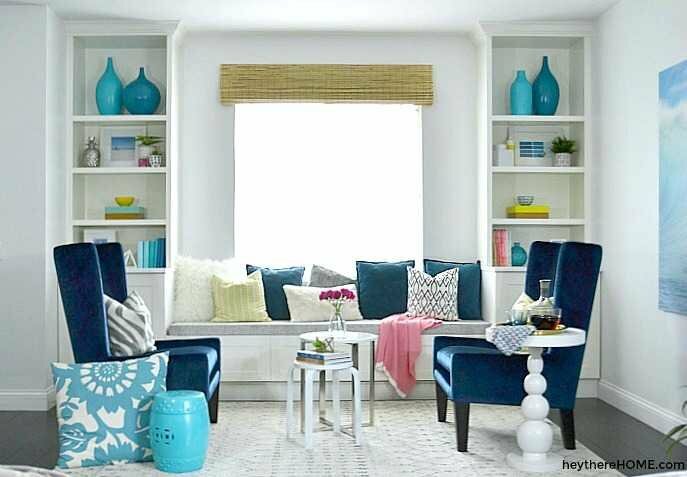 In this post you’ll learn how different whites look a bit different in each space depending on lighting and other colors in the room so picking the right white paint for each individual room is important to get the right feel. That said, you may find a white that does work in multiple areas of your home, which does make life (and touch ups) easier, for sure. In my own home I used a warm white in my office because I wanted to soften the white lights I have and I spend a lot of time working in here and blue light strains my eyes more. In my front sitting room though, I used a cool white on the walls. This is a great example of choosing a white based on how you want a room to feel. 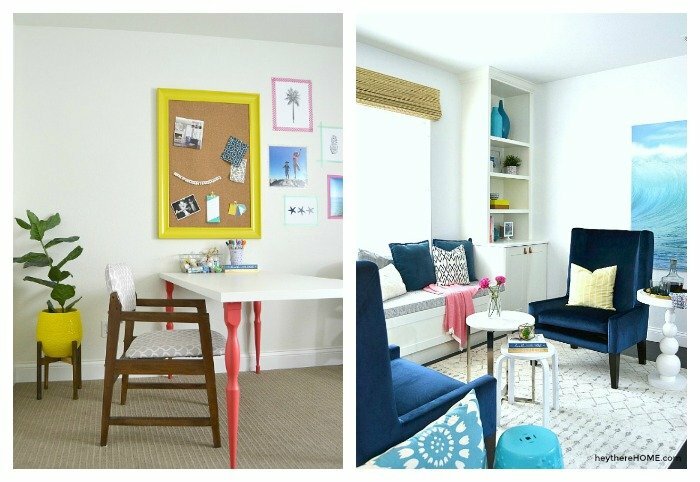 Why Do Your White Walls Look Too Yellow, Pink, Or Purple? The reason some whites end up looking yellow, pink, or even purple is because most white paint colors aren’t pure white. They are a very very light shade of a color. To the naked eye, they look white, but if we look closely we can see they have a tiny ounce of color. That evident color is the undertone and it will show up ever so slightly once you paint your walls. The undertone is what makes your white less stark or bright, which is a good thing. But if you get the wrong undertone it can be a disaster. How Do You Identify Undertones In White Paint? Identifying undertones in white paint is a lot like identifying undertones in neutral paint colors. If you’re looking at a paint swatch with multiple shades on it, you’ll look at the darkest shade to see the undertone. For example, when you look at a few white paint strips next to each other, the light shades at the top look very similar. It’s not enough to choose your color based on these shades alone. You’ve got to look at the darkest shade on the swatch to really see the undertone or base color that those light shades are made from. When you look at those darker shades you can see that some whites will have a yellow undertone, some a blue undertone, some a purple undertone, and some a grey undertone. Let’s take a closer look at 3 examples. In the first photo, below, you can see that the darkest shade has a little bit of brown, and you can definitely see yellow in the other colors on the swatch. So the undertone of even the lightest shade will be a warm yellow. The next swatch looks almost the same in the lightest shade, but if you look at the darker shades, you can see a lot of green, so there will be a slight green undertone even in the lightest shade. And on the last swatch, even though the name of the lightest shade leads you to believe that the color is a very true white, studying the darker shades will teach you that there will be a blue undertone, making this a cool and crisp white. 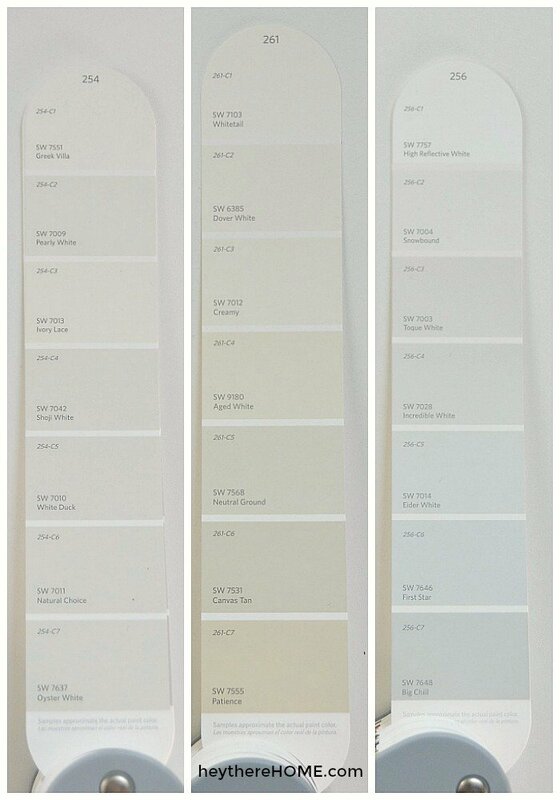 So then how do you take this information and choose the right white for your walls? First you need to decide if you want the white in your room to be a little bit warm or if you want a cool, white. Cool whites will be brighter and warm whites will feel a little more cozy, so it really depends on the feel you’re going for. You also need to take into consideration the lighting in the room you’re painting. Rooms with northern exposure don’t get direct sunlight and the natural light coming in has a blue hue to it. This will enhance any whites with blue, grey, or purple undertones. Southern exposure rooms have the most intense light and have a natural warm hue with the direct light coming in, although the light can and will shift throughout the day. And eastern and western facing rooms will have cool light and warm light depending on the time of day. For walls it’s best to go with as little sheen as possible. Flat paint will absorb the most light and give you the truest color, but they also show the most wear and smudges. So going with an eggshell or satin sheen is usually best, especially in high traffic areas or if you have kids, so you can easily wipe them clean. Once you’ve narrowed down your choices for white paints, definitely get samples and paint a nice size sample on each wall in your room. This is because the light will hit each wall differently and you’ll want to see how it looks at different times of the day as well as at night when you have artificial lights on. The same undertone rules apply for choosing white paint for cabinetry. You’ll want to decide if you want a warm or cool white and take the lighting situation into account. You’ll also want to choose a really durable paint and go with a glossy sheen so you can easily wipe down your cabinets. If you’re painting the walls next to your cabinets white, you don’t necessarily have to choose the same color for both the walls and the cabinets. You may want to go a shade darker or lighter for one or the other, or maybe even a little cooler or warmer for one. Remember the color could read differently on cabinets vs. the walls because of the sheen you choose or it could be that the sun hits the wall with the cabinets differently than it does the wall. You can’t tell unless you look really closely, but the white I used on the walls in my front room is different from the white I used on the built in cabinetry. The wall color is a cool white (White On White by Glidden). It has a slight blue undertone which makes it really crisp. Even with direct (warm) sunlight coming in here in the late afternoon, this room feels cool because blue absorbs red. — The blue undertone absorbs a lot of the warm tones in the light coming in. On the built ins, I needed the shelves I built on top, to match the store bought cabinets below which are a barely off white with a slight yellow undertone. So I got a custom color match mixed. The very slight variation in whites in here makes the built ins pop just enough and warms up this room a little bit too. I’ll admit, I’m a sucker for bright white trim. I usually just buy high gloss pure white paint right off the shelf and don’t even bother looking at color swatches for trim. Using a bright white (unmixed) paint also means that you can find it again when you need to do touch ups. However if your home’s color palette needs a warmer white for the trim, you should go with a neutral off white and avoid too much yellow in the undertone. A neutral white will have a dark shade with some brown and/or grey in it. It won’t have a lot of orange though. It’s best to do trim in a gloss. If you don’t want it to look shiny, do a semi gloss, but the shinier the easier it will be to dust and wipe down. Remember that the glossier the paint the more reflective it is. Which means it will absorb less light and therefore absorb less of the colors around it. In fact, glossy surfaces will bounce the other colors in the room around more. 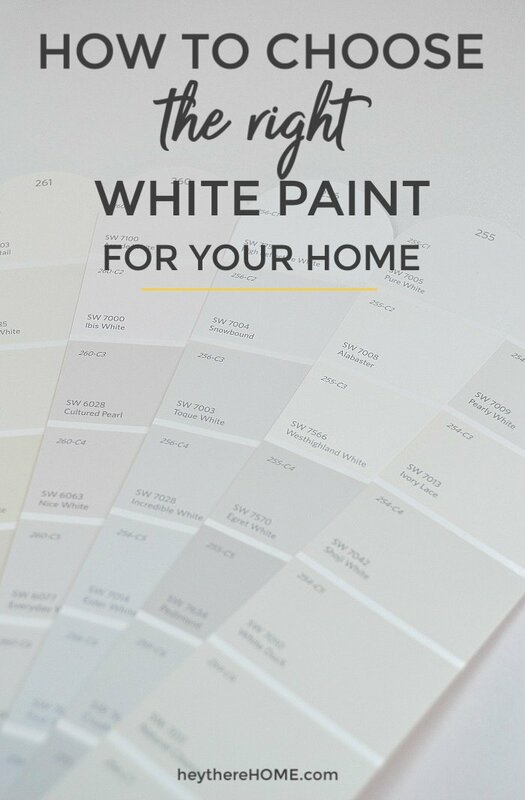 Now you’re armed with a lot of really good information about how to choose white paint colors for your home, but I know that standing in the paint aisle can be really overwhelming, so I thought I’d give you some of my favorite white paint colors as a starting point to help you choose your perfect white(s). Neutral white paint colors will take the bright starkness out of your white but they go great with both cool and warm colors so they’re really versatile and timeless. Warm white paint colors will be your least bright off whites and bring warm tones into the room. They’re a great way to make the natural blue light in northern exposure spaces feel a little bit warmer and cozier since they’ll counteract the blue. Keep in mind though that any color looks more intense in rooms with northern exposure. Cool whites will be the brightest and most crisp feeling. The blue undertones being a little brighter than cool whites with grey undertones. Blue absorbs red so if you’re trying to counteract too much warm light coming in, choosing a white with a slight blue/grey undertone will tone down the red hue of the light. 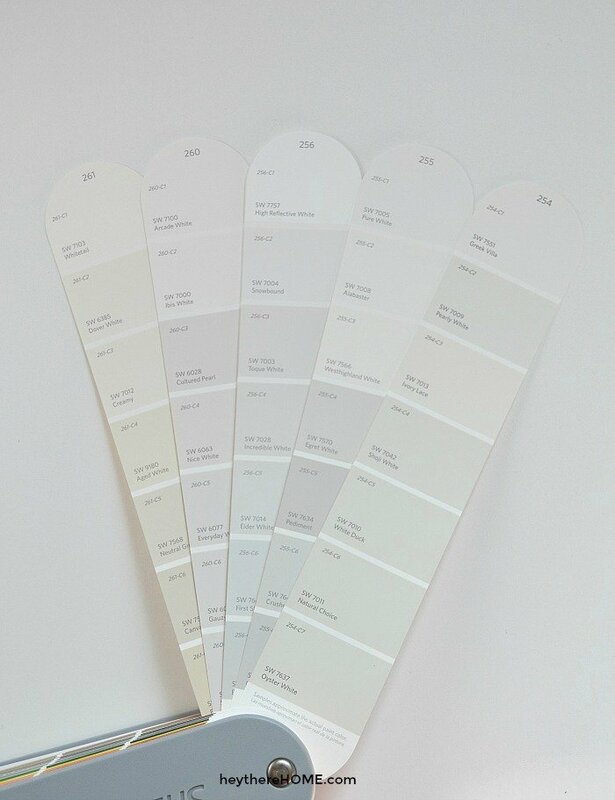 Paint companies seem to be moving away from providing swatches with the different shades of the color on the same swatch, which makes identifying the undertones more difficult, especially if your new at this. One way you can still identify the undertone is to look at the color swatches around the color your looking for. In other words look at the entire wall of paint samples as a swatch. They usually go from light at the top, to dark at the bottom and those dark shades will have you undertone. They’ll also go from cool to warm as you move from side to side. I do however think that looking at the swatches like I’ve shown here in my photos is the best way to go because you can see them in your own home and get a good feel for how they’ll read with the lighting you have. Of course the swatches are just a starting point. If you’re serious about finding the right colors for your home and have a brand of paint you typically like to use, you should buy a paint deck so you have all the colors on hand. Paint decks are so helpful because they show the various shades of each color and you can use the neighboring colors to go a little cooler or a little warmer from one strip to the next. >>You can find most brands paint decks on Amazon here. Hi what would you use to paint the inside doors and a back door in a kitchen . A semi gloss pure white ! I would definitely use a semi gloss, Carol, so they’re durable and can be easily cleaned. I do prefer pure white but I also have my baseboards and other trim in my home done in pure white. So I would go with the same white as your baseboards and trim in a semi gloss for your doors as well. Hope that helps! If you buy paint often for projects, ask the paint store for paint deck. Often they provide them to you. Never hurts to ask! This comes at a time when I’m looking to paint all the walls ‘white’…:) My 14 yr.old daughter painted her bedroom over the March Break and she also wanted something just a little away from ‘white’. She had light and darker pink stripes on her walls and we had a small quart of the light pink leftover from several years ago. So she dumped that pink into a gallon of plain white and is extremely happy with the results. The pink is more noticeable in the morning, south exposure, and looks more plain white in the evening with less light coming in. She did everything herself….filling the holes, taping the trim off, and priming first!! Hi Sarah, I love your daughter’s idea! So glad you’re both happy with the results!